The first message from our founder. Hello supporters of Can YA Love. I am excited to finally have this opportunity to sit down and share my thoughts with you. Our work is not complete if we keep the people who live in these slum communities hidden from the eyes and hearts of the rest of the world. The millions of orphans around the world, who live with NO support, scavenging for food and struggling daily just to survive, rely on us to tell their stories. I am writing to help tell those stories and how we are helping. As Randy mentioned in his previous blogs, our first international project is The KenYA Love Project. Many people have asked me, “Why start in Kenya?” My answer… Why not? Over 67% of Kenyan citizens, using the power of the vote, passed a new constitution in August of 2010 that spreads the power of government across different branches, much like the government in the U.S. The addition of these checks and balances, a more decentralized government and new voting laws are reducing corruption in the central government. Kenya is the shining star in a region plagued by extreme violence and political unrest. Only three years ago, Kenya itself was caught up in political unrest that brought death and suffering to many communities. With this memory in their hearts, Kenyans are yearning for change, believe it can happen, and are working hard to make their nation and their communities better and more just places that are free from violence. Nations across the world are looking to Kenya as an example of democracy being achieved politically. Kenya is home to the largest and most densely populated slum in Africa, Kibera, a place 30 times more densely populated than New York City. More amazing, is the fact that most people in Kibera live in single story “shacks” that are made of mud walls and corrugated tin roofs and often have doorways so small, one has to crawl to be able to get inside. 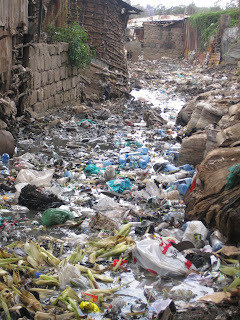 Take a look at the picture below to get a sense of life in Kibera. Now imagine living here with only one toilet for every 300 to 1000 people, trash and waste piled wherever it can fit, no clean water, and children playing in their bare feet. The rain, which should bring life to Sub-Saharan Africa, brings the opposite. Rains lift disease carrying waste through the slums, making the ground toxic, destroying crops, and breeding mosquitoes that carry malaria. With the rate of HIV/AIDS having climbed as high as 50 %, many people’s immune systems are defenseless, leaving tens of thousands of children to navigate this existence by themselves. 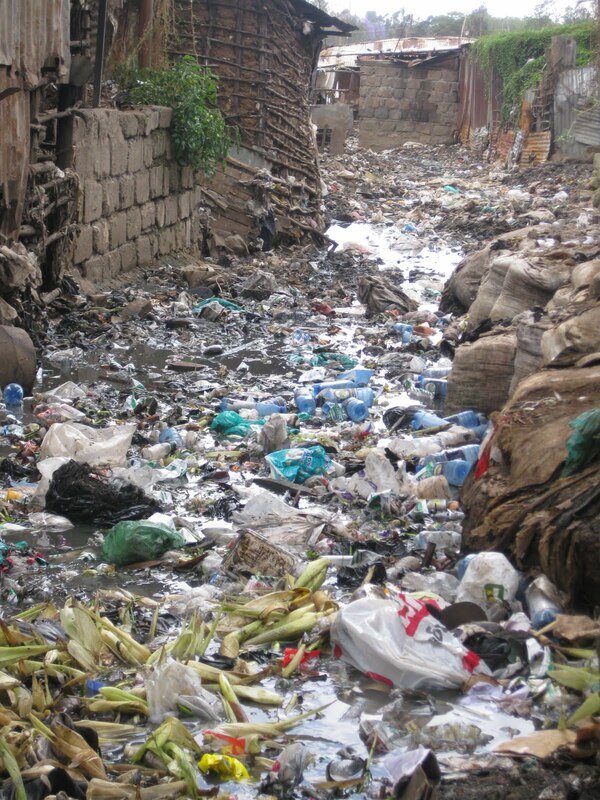 Food scarcity and lack of sanitation are responsible for nearly every death in the Kibera community. Our gardening systems combat both! There are many NGOs starting gardening projects in Kibera (as seen on our previous blog,) but they have yet to make the impact needed because of the lack of space in the heart of the slums. Our organic gardening systems provide 10-25 times the growing space compared to the ground space used because we grow vertically. We will be working with preexisting self-help NGO’s to teach at-risk youth, namely orphans and families with single mothers infected with HIV/AIDS, how to use our vertical growing systems. A portion of the money raised by each garden will fund things like building more gardens and toilets, incentivizing sanitary systems, providing school meals, and much more. With weather that supports year-round agriculture, the fertility of the soil relies on composting as its life blood. I love this, because vegetable scraps are so valuable to our gardens, that we can treat it as a form of currency! People can bring vegetable scraps to our composting stations to be weighed and credited. They can then use it to get fresh vegetables, bed nets (to avoid nocturnal malaria infected mosquitoes), shoes, water, or their own personal gardening system, to name a few examples. This incentivizes eating healthy vegetables and reduces waste buildup in these communities. We believe a system like this can work in Kibera and in places all over the world. We appreciate the immense response from the blog thus far and I look forward to answering more of your questions and hearing more feedback. A special thank you to the outpouring of volunteers who have made this project possible.